Opulent furnishings for the Victorian bedroom include a Quilt cover, matching Pillow Shams with ruffled edging, and Dust Ruffle for twin, full, queen, and king bed sizes. The Dolly comes in two shapes and can be enlarged for a dresser scarf. Throw Pillows (round, square, heart-shaped) echo the Quilt Cover design and can be down-sized for use as Sachets. The self-ruffled mobcap functions of a Nightcap, and a Potpourri recipe provides a Victorian scent of by gone flowers. 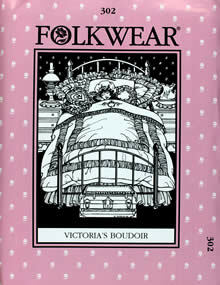 Pattern includes designs and instructions for authentic embroidery and cut work, plus a Victorian alphabet for monograms.